What’s that — another college protest, you say? Ho hum — isn’t there anything decent to watch on the tube? We should, however, examine this event and similar ones and offer some observations and conclusions. 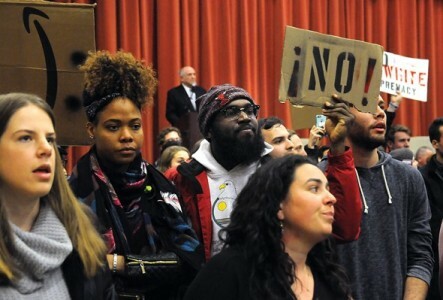 By so doing, you will be able to frame future protests in general categories such as qualified and legal protest, rabble rousing, conspiracy to incite and carry out violence, or other. A Middlebury College student club invited social scientist Charles Murray to speak there on March 2, 2017. He faced an assembly of about 400 students and was booed and harassed starting at his introduction. As he begins speaking, the pre-rehearsed protest babble kicks in: “Who is the enemy? White Supremacy,” “Hey, hey, ho, ho — Charles Murray has to go,” “Racist, sexist, anti-gay, Charles Murray go away.” College leaders then decided to ferret Mr. Murray away to another room for a private interview. Students followed him down the hallway, still bellowing and now pulling fire alarms. Professor Allison Stanger and others led Mr. Murray out of the building. They got into a car while the protesters jumped on the hood and rocked the vehicle back and forth. Ms. Stanger was hospitalized and had to wear a neck brace. 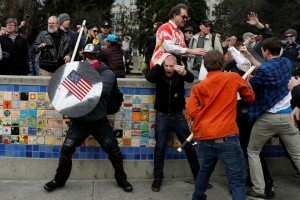 Berkeley, California: I support the President – Hey, why are you hitting me on the head? On March 4, there were many pro-Trump rallies that took place across these United States. Most took place without incident. Not so in Berkeley, California — would this be a surprise to you? Shouting matches quickly degenerated into violence between the two ideological factions. Anti-Trump protesters violently attacked the pro-Trumpers, who in turn defended themselves. Police wound up confiscating bats, pipes, pieces of wood and bricks from several of the protestors. There were numerous minor injuries resulting from kicking and hitting — miraculously, no one required hospitalization. All in all, the police arrested ten people. This was a planned and permitted “March 4 Trump” demonstration. What started as a peaceable assembly of pro-Trump supporters, a rally as opposed to a protest, evolved into a confrontation (not even a protest) between two ideologically opposed groups of people. That’s the first problem—how the media framed this and many other clashes—as protests. This was no protest—Trump supporters were rallying—that’s a positive thing. Then along came the riff-raff that clashed with them because they didn’t like the message. That’s not protest either — that’s assault and battery which is exactly what Berkeley police arrested ten of them for. Both groups had to disperse because of the unlawful actions of one of them. Free Speech, Assembly, Petition and Protest – Same Thing? Over time, interpretations of our founding documents have changed and have been reshaped by jurisprudence. Initially, Congress approved the right to petition with little controversy. Not so for the right to assembly. Several of the states and representatives felt assembly didn’t need to be spelled out separately. By the way, petitioning only means you can present gripes, whines and, uh, grievances to the sovereign (government). It’s interesting to note in these early days of petitioning the U.S. Government, written petitions were delivered to the House floor where they were read aloud and referred to committee for discussion. Yes, there was time set aside for only that purpose. Wouldn’t that be nice in today’s Congress? In our times, grievances are almost always staged events designed to elicit social awareness on social media or television. Their goal is to pose a heavy social cost to those who ignore the protest subject matter. I don’t know the percentage of violent vs. non-violent protests, but I suspect the raw number of non-qualified protests is rising. Public condemnation of violence in all its forms is necessary to reduce the amount of these false redresses of grievances. Many Americans are witnessing collective violence, looting, sacking, stealing, assault and other crimes with the perpetrators claiming “legal protests”. Nothing could be farther from the truth. These ne’er-do-wells are only interested in fomenting violence and nothing else. Knowing more about our U.S. Constitution and the Bill of Rights will help you to clearly see what’s going on the next time a “protest” is reported in the media.